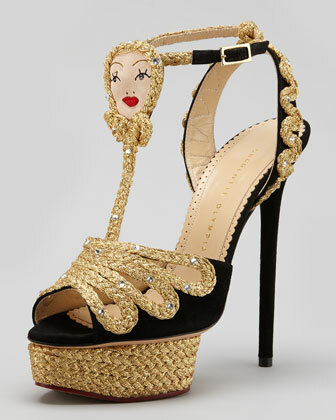 Today's So Shoe Me is the Rapunzel Braided Platform Sandal by Charlotte Olympia, $1595, available at Neiman Marcus. Let your hair down with Rapunzel realness in these fairy tale heels by Charlotte Olympia. Known for adding a serious dose of not-so-serious characters to your shoe collection these Charlotte Olympia heels are the perfect high fashion heels that will leave a lighthearted step. Beautifully braided tresses and a punchy red pout add the iconic details of this fairy tail damsel for a delightfully cheeky brand of fashion humor. Pair these kicked up heels with a baroque embellished vegan leather dress and simple accessories to let these signature shoes steal the show. So Shoe Me a pair of rad Rapunzel heels that will give me me a seriously good hair day, no matter where my head is at.